SR 30 - Built for productivity! The Intermec SR30 handheld scanner offers the optimum combination of performance, durability, ergonomics and investment protection for. Designed to automatically adapt to different interfaces, the SR30 is fast and easy to install, and equally easy to reconfigure. 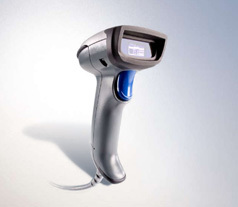 The lightweight SR30 delivers fast, always-accurate scanning even when bar codes are damaged or poorly printed. Take your pick from SR61XR (extreme performance near/far scanning), SR61HP (high performance 2D scanning) and SR61HD DPM (high density or DPM scanning). Best suited for: Applications in office and light industrial settings. Enables fast & easy connectivity. Reduces need for multiple devices & saves money. Scans without having to orient the SR30 to the barcode. Reads even damaged or poorly printed bar codes. Ensures it only transmits desired output to the host.